With graduation coming up this spring, and lots of work still left to be done, Alyssa Vega is finally getting ready to plan her future by meticulously choosing classes based on her potential careers. Former volleyball player, Vega, is also excited about her senior year and hopes to make memories with her peers. She also aspires to go beyond her limits in not only writing, but also in thinking. Similarly, AP student, Isaac Hernandez, hopes to have a fruitful senior year that does not include so much stress. He is currently taking three AP classes and is a club organizer for ASB. Both Hernandez and Vega share the same attitude towards not losing it while taking so many AP classes. 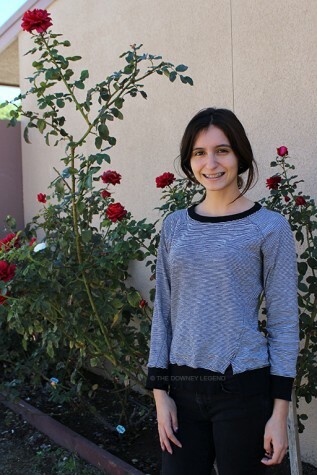 Not only does Vega aspire to do her best, she also looks forward to gaining beneficial information from her classes and peers, while at the same time having an awesome time learning. Andrea Laguna, another delighted Downey High School senior, is taking an engineering class in design this year. She views this class as an innovative and fun learning challenge that she hopes to gain a lot from. Vega’s motivation and enthusiasm are great contributors to her future success and they are what keeps her going. By the end of her senior year, Vega just hopes to find what her passion is and she is also exciting to move to a new city, wherever her future college might be!